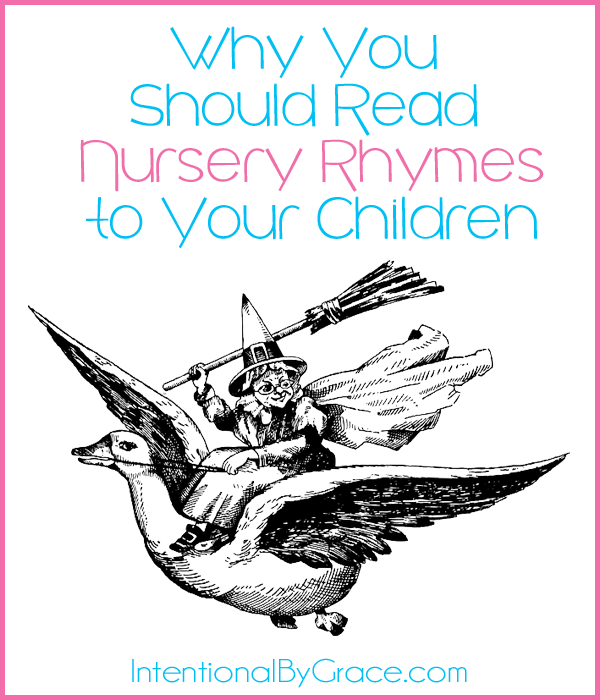 This post is written by contributing writer Victoria at Creative Home Keeper. As summer is well underway and we are spending the long, hot, lazy days doing various activities, the last thing anyone wants to think about is having to heat up the kitchen to cook a meal… let alone spending a lot of time actually doing the cooking! My kids are still little so we aren’t doing a whole lot of planned, summer activities yet but we are spending a lot of time outdoors. Most days you can find us playing at the park, enjoying some of our cities free attractions or splashing around in the plastic kiddie pool in the backyard. Come afternoon time this Mama is just as tired as her kids are! Summer is such a fun time to enjoy the days as a family and there are so many activities that pull our attention in all different directions, but we still have to feed our families. And while we may not want to spend hours in a kitchen warming it up to cook, we do want to feed our family healthy, balanced and nutritious meals. An added bonus is when those meals require very little prep work! 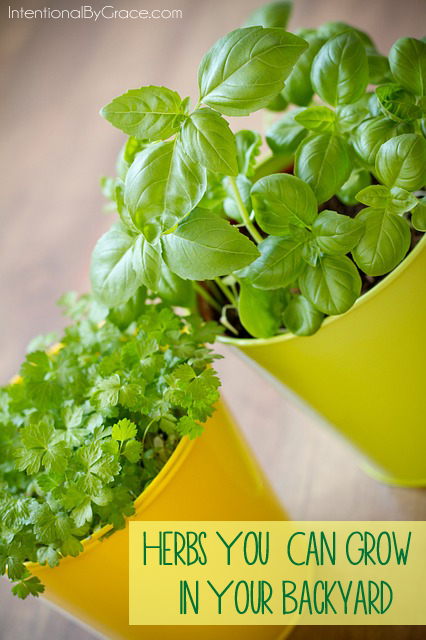 One of my summer time-saving kitchen secrets (I actually use this all year too!) is the cooked whole chicken. Depending on the size of your family, you can cook a whole chicken once and prepare several meals from it. My family usually gets about 3 dinners from one chicken, but I also cook more than one chicken at a time to get more bang for my buck! There are several ways to cook a whole chicken, though some do require a little more focused attention and heating up of the kitchen than the others. Rub olive oil, minced garlic, salt and pepper all over the outer skin and inner cavity. Place on a roasting rack in a roasting pan. Pour about 2 cups of water into the bottom of the pan. Roast the chicken in the oven at 450° for 1 hour or until the thermometer reads 160°. This is my least favorite option during the summer because it requires the oven to be on for several hours which not only heats up the house but also requires a lot of attention on my part. Place the chicken in a large stock pot with various chopped vegetables including onion, celery, carrots and garlic. Fill the stock pot with water and sprinkle salt and pepper. Bring the pot to a boil than let it simmer on the stove top for about 2 to 3 hours. Once fully cooked, usually the chicken is falling off the bones, remove the chicken from the pot and drain the broth from the vegetables. While I love that I am getting cooked chicken and tons of homemade chicken broth at once, this method also requires a little extra effort on my part since I don’t want the water to overflow and cause a mess (it’s happened before!) Plus it also heats up the kitchen as well. Rub the chicken with olive oil, minced garlic, salt and pepper and place in a large slow cooker (make sure you can close the lid). Pour a cup of water into the slow cooker and cook on low for 8 hours. This is probably the easiest way to cook the chicken and you can pretty much place everything in the slow cooker and walk away from it. I love to cook my chicken overnight so that way I can quickly shred the chicken meat in the morning and have it ready to go at dinner time. It doesn’t get any easier than buying it from the store, bringing it home and shredding the meat off the bones for several different meals. This is also one of my go-to options when taking a meal to a family in need. 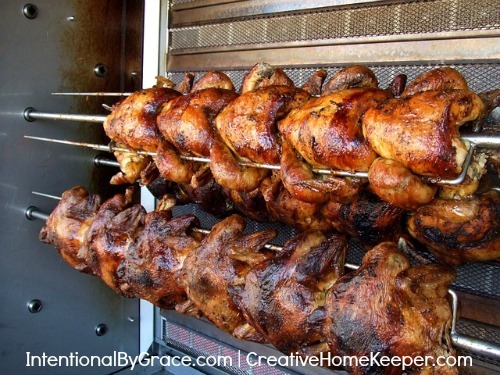 Whenever we go to Costco I always pick up a Rotisserie chicken (they are so cheap there!) and I always watch for when my local grocery store places them on sale. Even at full price they are still a fairly frugal option when looking at price per pound, though some areas do differ. Regardless of which method you use to cook the chicken, once it’s cooked and you have removed and separated all the chicken meat, skin, fat, and bones (save those parts to use to make homemade chicken stock), you usually have enough shredded chicken to divide up into a few meal portions. So now that you have all that shredded chicken, what can you do with it? Plenty! Here are a few of our family’s favorite no-cook or low-prep dinner ideas for those summer days when I’m too tired to spend any extra effort in the kitchen. Sprinkle some shredded chicken over a fresh salad loaded with greens and summer vegetables straight from your garden or from the farmer’s market. Add some old crusty bread, crumbled feta cheese and a homemade vinaigrette for a complete meal. Load up the chicken on a sandwich bun and pour your favorite barbecue sauce over it (I’m a Kansas City girl so I love my barbecue sauces!) Serve with some vegetable sticks, grilled corn on the cob or simple potato chips. Sprinkle the chicken with 1 tsp of ground cumin, a handful of freshly chopped cilantro and the juice of 1 lime. Place the seasoned chicken into a corn tortilla, or large piece of romaine lettuce, and top with shredded lettuce, diced tomatoes, salsa and cheese. Serve with some black beans, homemade chips and salsa. In a large skillet saute 1 tbsp of minced garlic in olive oil over medium heat. Add green pepper and onion slices and cook until vegetables are tender. Remove from heat and stir in a small container of plain yogurt, ½ tsp ground oregano, ¼ tsp ground allspice and 1 ½ tsp lemon pepper. Spoon chicken and vegetable yogurt sauce into pita pockets. Serve with sliced cucumbers, green bell peppers and hummus. Who doesn’t love pizza? Homemade pizza is not only much tastier, it’s also delicious. Shredded chicken can make the perfect topping for just about any pizza combination. 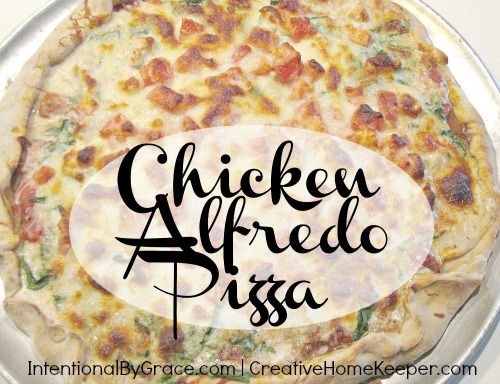 Our family favorite is Chicken Alfredo Pizza. Season the chicken with 1 tsp Italian seasoning and grated Parmesan cheese. Toss the seasoned chicken on top of some pasta, fresh tomatoes, mozzarella cheese and some basil for a quick and easy summer pasta dish. Those are just a few of our family’s many favorite ways to use the shredded chicken during the summer days when we want quick, easy to throw together, healthy meals. 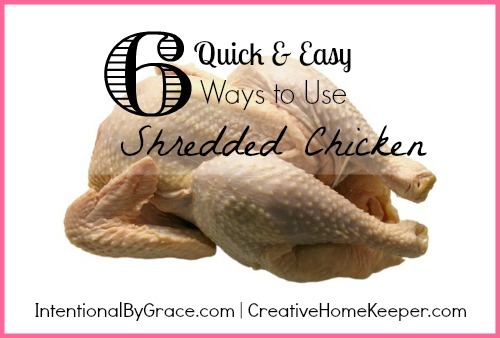 When it comes to shredded chicken the options are endless so you can easily swap in the shredded chicken you already have ready to go in your refrigerator, for any of your own family’s favorite meals. What are some of your favorite ways to use cooked chicken? This is the only way that we get chicken in our house (cooking a whole chicken in the crockpot) because we want free range chicken and the cheapest way to do it is by buying a whole chicken. They are usually small but I can get about 3 meals out of mine too. I have found that many recipes are just as good with shredded/cut chicken as they are with chicken breast. They may have a different texture to them, but that’s fine with me. I do chicken pot pie (a little more labor-intensive but so worth it), quesadillas, burritos, nachos, white bean chicken chili, and the list goes on! This is, by far, the easiest and most frugal way to make sure my family has healthy chicken. Abby, you sound like us! The free-range chickens are smaller, but we can still get several meals out of them. We love chicken pot pie too! Soooo good! We love to do BBQ chicken pizza. Sounded weird at first, but it gets gobbled up fast around here! Thanks for the ideas! Casie I’m a fan of BBQ pizza too! Victoria @ Creative Home Keeper recently posted…First Day of Summer Deals and Steals! I, too, rely on the whole chicken because it is so economical. I usually cook 1-2 per week. I use the crock pot when I am cooking one, and this oven roaster to cook 2 chickens at once http://amzn.to/1mfjl7H. I also use shredded chicken in enchiladas and casseroles. Costco’s rotisserie is my favorite, but as it is 2.5 hours away from where I live, I’m usually cooking them myself. Thanks for the Chicken Alfredo Pizza recipe. Need to try that one!